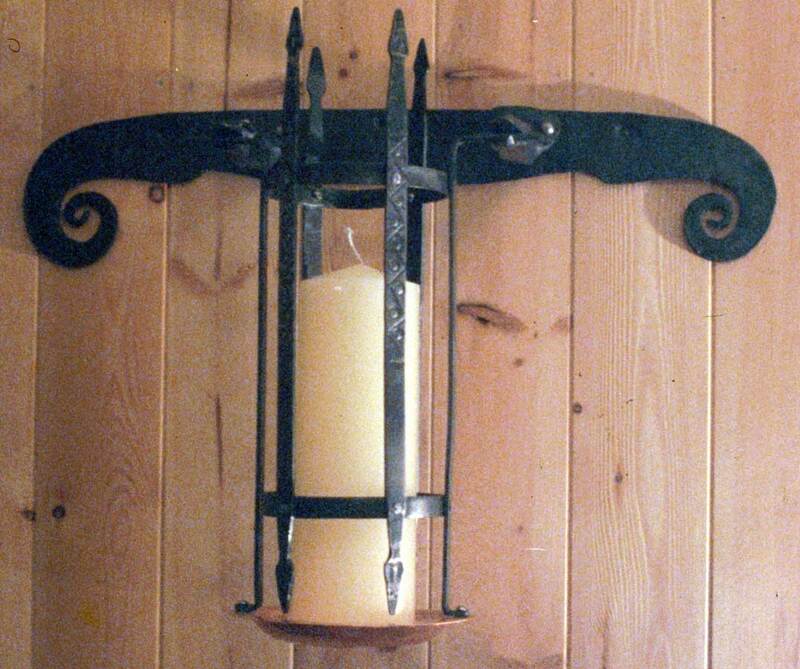 Welcome to the Wareham Forge, the work of Artisan Blacksmith Darrell Markewitz of Ontario Canada. Here traditional hand forged techniques are blended with original custom designs to create distinctive objects for garden or architecture. (What is called 'wrought iron work' by some.) A specialist in the Viking Age, creating reproductions for Museums and re-enactors. Offering training courses various aspects of Metalsmithing, plus instructional DVD's. These pieces represent a much larger body of both custom and regular production work from over the past years. The individual design of each project is very important to me, so for that reason no two pieces are exactly alike. No use of jigs or factory made parts here! This stress on design, plus the freedom permitted by hand forging each element, means that I can make "just about anything"! In 2013 I invested both coin and considerable time into building a 30 ton hydraulic press for the workshop. The primary reason was to asssist in compacting blooms from my iron smelting work. The immense power of the press suggested other forming possilities, which I started to slowly explore. The raw power needed to be carefully controlled, but could allow for the creation of forms difficult for me to accomplish with simple 'one man power'. 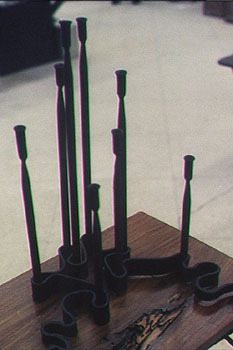 the 'Massive' series required some experiments in tools and forming dies. 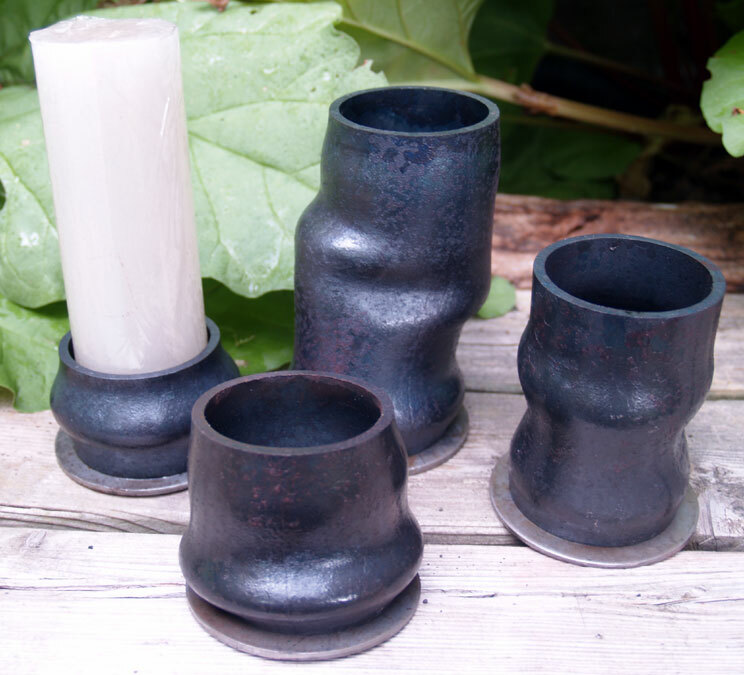 Heavy solid blocks of steel are deformed and shapped, with sockets created that hold a standard 3/4 decorative candle. Although the results seem simple enough, the real surprise comes when the considerable mass of each is found when they are picked up. the 'Compacted' series starts with large diameter, steel pipe or structural tube. By controlling the application of temperaure, distorted and wrinkled shapes can be be formed under the press. Ideal as unique containers, or holding pillar candles as seen. 'Structural' is an example of my observations on the techniques and uses of materials from early Art Nouveau forged work. In the late 1800's, new structural materials became widely available. Industrial profiles like U shapped channel and V shaped angle. Of course the artisans of the time would 'explode' the ends of these strong supporting shapes, then forge the many flat segments thus created. I had been initially approached by someone wanting an even larger floor stand candelabra (who then balked at the cost). I took some of the concepts I had been drafting and created this 'smaller' object. 'Structural' has its three legs each formed from a section of 1 x 1" angle laid inside 1 x 1 1/2" channel, each forged to spread wider (to 2 3/4"). The ends of all these have been cut open and forged into a series of tapered reversal curves (total of five elements, both ends of each leg). The top is formed to contain a 3" diameter pillar candle, the one seen in this image is 10" tall. The total height is 32 inches, with the spread of the legs at roughly 17" a side. 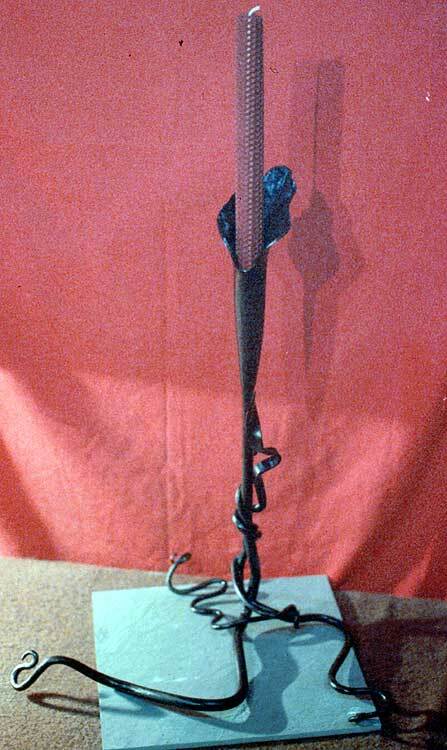 The main elements of this piece were forged as demonstration at the 'Earth, Air Celtic Festival' in 2004. Inspiration for the design came from Viking Age metalwork - in this case the Eagles of O∂in. 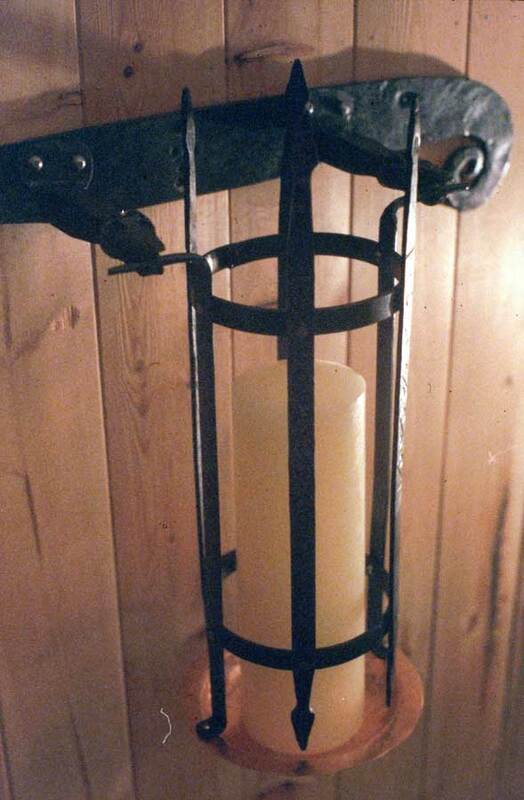 Completed as a wall mounted candle holder. The finish is a dark green merging to black at the top. Some objects in this series available! Interested? The first of this series of unique pieces was created in 2003 for my display at Canada Blooms. I wanted some way of taking the work I had been doing with natural forms rendered in heavily forged structural shapes and reducing the overall scale. Each is about two feet tall and consists of the metal 'plant' and a natural stone slab base. 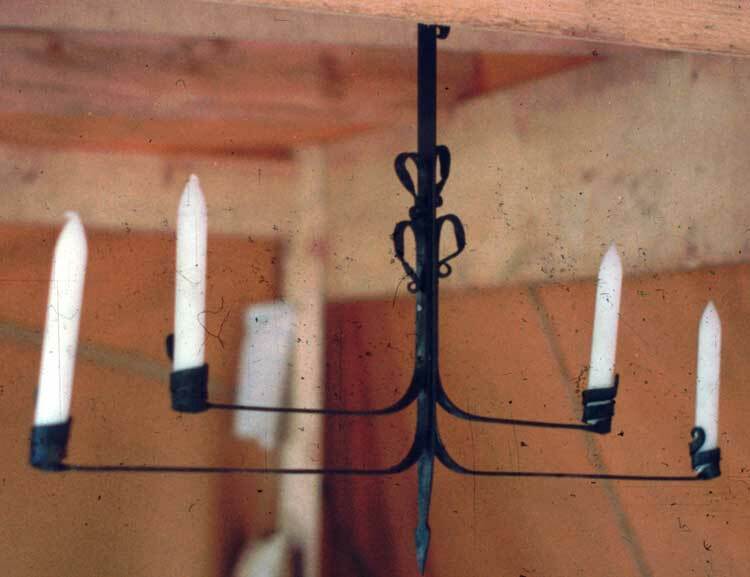 The main stem of the plant ends in a flared tube, intended to hold a beeswax sheet candle. Each has several leaves or tendrils - employing a number of forming techniques that I have developed. They also feature simple decorative colours in the paint work - subtle colours with highlights. The finished pieces can be used indoors or out - and are both small and stable enough to be moved as your taste suggests. Although discussions on the project started with the candelabra, it was in fact the last object produced. The requirement was to 'fill' a loft space in a room that was 18 x 35 x 16 ft. high. 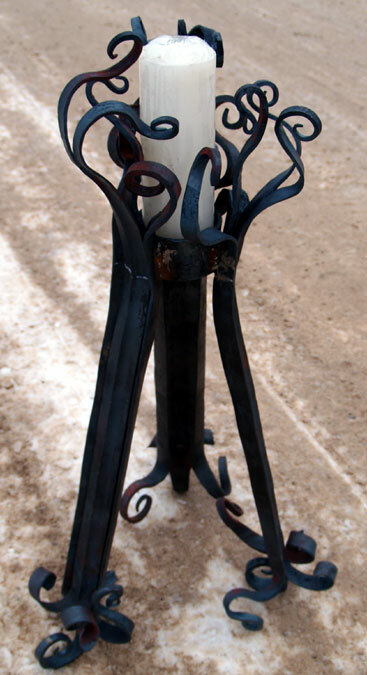 The central core is made up of a series of 2 1/2" dia heavy steel tubes, forged with flares and twists, about 8 feet tall. Each tube ends in a formed stainless steel shade that covers over the movable quartz-halogen pot light, seven in all. Support for the individual arms was provided by hidden tubes underneath wraps of 1/2" dia rods. The 14 arms branch out on two levels swept out an off centre oval about 10 x 15 ft. The total weight was about 400 lbs. Not shown in the photograph are the custom glass shades I commissioned to fit into the end loops of each of the arms. These were a conical shape, clear glass distorted to look like melted ice. Each held a 1 1/2" dia pillar candle. 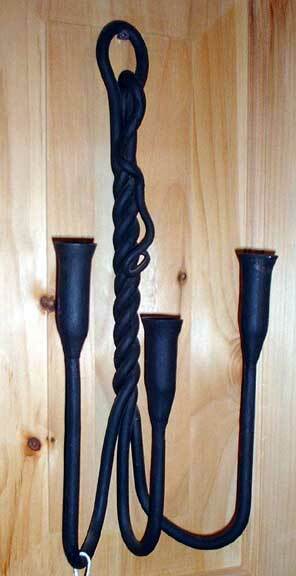 The Norse Candle Sconce was made as a matching pair, again commissioned as a wedding gift. The concept was to take historic elements and combine them into a design that would reflect modern use. The pillar candles rest in a hand dished copper bowl, contained within a frame made of thin flat bars. The individual bars have the 'line and dot' pattern common to Norse metalwork, and also end in punched serpents heads. The wall mount is forged and punched into the shape of double headed eagles, a common Viking Age symbol. From the mount are attached two stylized wolf heads sculpted from 3/4 inch square bar. Each of these holds a pin from the candle cage in its mouth, permitting the candle basket to be removed. Now in the Collection of David and Anne Cox of Peterborough. 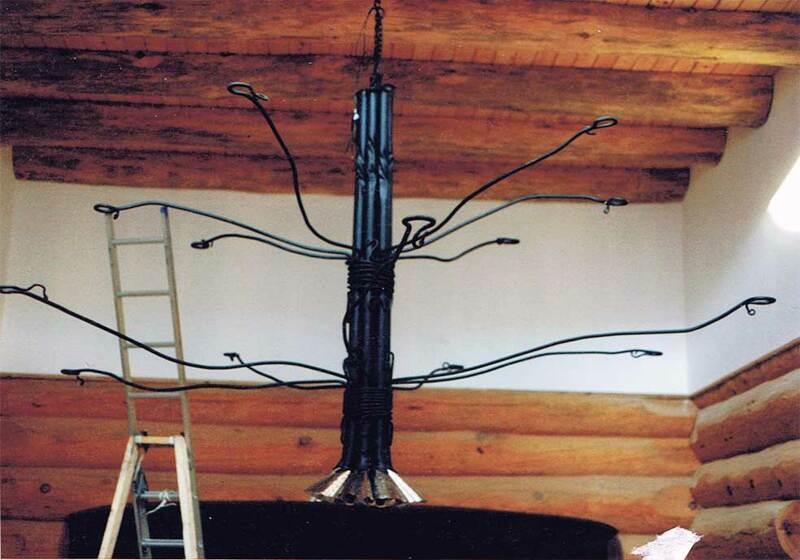 This larger candle holder is in the form of a Menorah - one of several I did over 2000 and 2001. I was interested in the design of ritual ware for the modern Canadian - an offshoot of my work with early medieval artifacts. The intent was to create objects that would fulfill the ritual purpose for a 'High Holiday', but at the same time could perform as a decorative element at other times of the years. This piece uses small diameter tubes to hold the eight candles, which sweep in height from the ends to the centre of the piece. The individual holders are tied together by a ribbon of tapered flat stock formed to sinuous curves. Another Menorah in this series was formed of two separate pieces. Placed apart the exact significance was hidden, but when positioned together the eight candles function for the ritual. 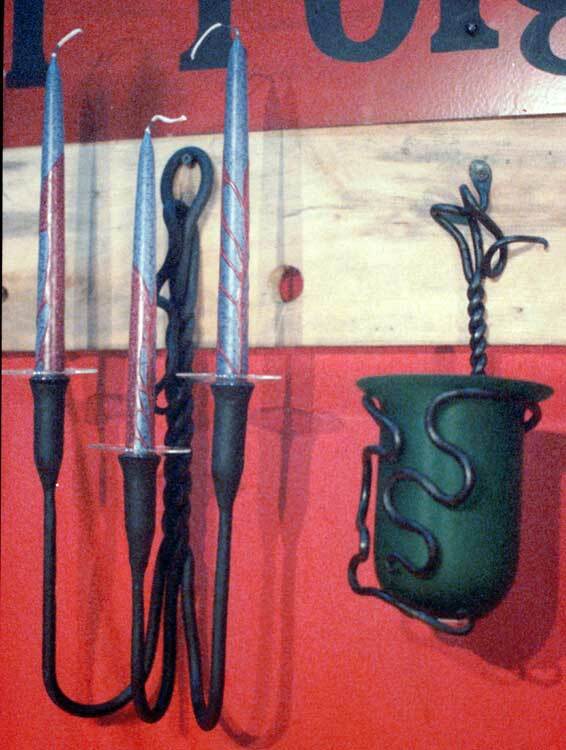 These images represent some of my earliest work with forging heavy industrial pipe in the early 1990's. Since then I have gone on to greatly expand on the possibilities of this material! From small table or wall candle holders to larger candelbras, I always try to have a least a few unique objects on hand.